In a large sauce pot, bring wine and sugar to a boil. Reduce heat to simmer and add berries. Allow mixture to bubble slowly for 10 minutes until the berries begin to absorb the liquid. Remove pan from heat and allow to cool. Add mascarpone, ricotta cheese, honey, and vanilla extract to the bowl and whip until well combined. Using 4 wine glasses or small glass desert bowls, place 1/4 of the crushed shortbread cookies in the bottom of each. Next, layer approximately 1/4 of the cheese mixture and 1/4 of the berry mixture, ending with a sprinkling of the crushed cookies in each. 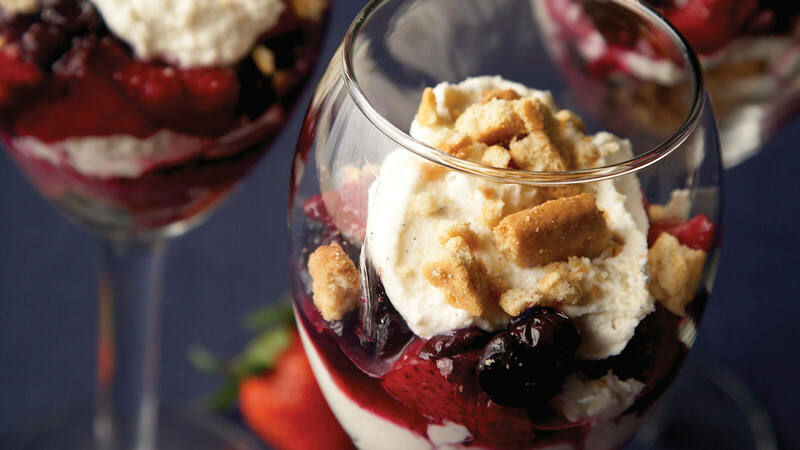 Allow trifles to chill in refrigerator at least 2 hours or overnight before serving. *TIP - Don’t throw away the empty vanilla pod. Toss the bean in an airtight container with 2 cups of sugar. In roughly 1 week you will have delicious, vanilla infused sugar. Use anywhere you would normally use sugar for a delicious vanilla flavor!